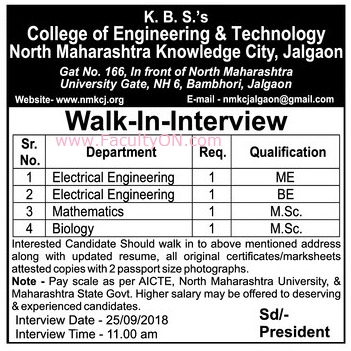 KBS College of Engineering and Technology, Jalgaon has advertised in the LOKMAT newspaper for the recruitment of Assistant Professor jobs vacancies. Interested and eligible job aspirants are requested to walk-in on 25th September 2018. Check out further more details below. About College: "North Maharashtra Knowledge City", established in the year 2011, aims at imparting higher & technical education to the people of the region. We look forward to produce new generation of Engineers who will work efficiently to make our society a developed one. How to Apply: Interested and eligible candidates are requested to attend the Walk-in interview along with CV, all original certificates / marksheets & attested xerox copies of certificates and 02 PP size photo to the following walk-in address. Bambhori, Jalgon - 425 002, MS, India.